Many Americans continue to see the Mormon faith as unfamiliar and different. Half say they know little or nothing about Mormonism, half say it is a Christian religion while a third say it is not, and roughly two-thirds believe Mormonism is “very different” from their own beliefs. There has been virtually no change in these impressions over the past four years. About half of all voters, and 60% of evangelical Republicans, know that Mitt Romney is a Mormon. The former Massachusetts governor’s religion has implications for his nomination run but not for the general election, should he be nominated as his party’s standard bearer. White evangelical Protestants – a key element of the GOP electoral base – are more inclined than the public as a whole to view Mormonism as a non-Christian faith. And this view is linked to opinions about Romney: Republicans who say Mormonism is not a Christian religion are less likely to support Romney for the GOP nomination and offer a less favorable assessment of him generally. But they seem prepared to overwhelmingly back him in a run against Obama in the general election. These are the principal findings from a new national survey by the Pew Research Center for the People & the Press and the Pew Forum on Religion & Public Life, conducted Nov. 9-14 among 2,001 adults, including 1,576 registered voters. In the race for the GOP nomination, Romney trails Herman Cain by nine points (26% to 17%) among white evangelical Republican and Republican-leaning voters. Romney leads among white mainline Protestant Republicans (26% to 17% over Cain) and runs about even with Cain among white Catholic Republican voters (26% Romney, 23% Cain). The survey finds that overall opinions about Mormonism have changed very little since Romney’s last race for the White House. 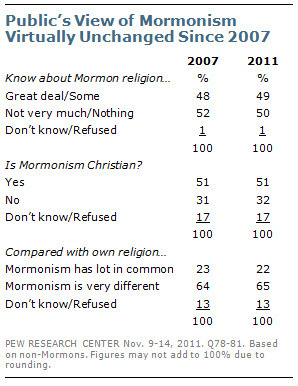 About half (49%) say they know a great deal or some about the Mormon religion. And about half (51%) say the Mormon religion is Christian. Roughly a third (32%) say Mormonism is not a Christian faith – a figure that rises to 47% among white evangelical Protestants. 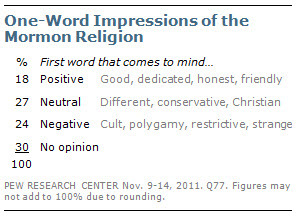 When asked what one word best describes their impression of the Mormon religion, most Americans either have no opinion or offer relatively neutral words like different, conservative, Christian or Utah. About one-in-four (24%) give assessments that are negative in tone. Overall, cult is the most frequently used word. Other negative terms include polygamy, restrictive, strange and misguided. An additional 18% offer positive words such as good, dedicated, devout, faithful and honest. The overall balance of positive, negative and neutral words, as well as the words themselves, are largely unchanged from how people described Mormonism four years ago. Impressions of the Mormon faith are virtually identical across party lines: roughly two-thirds of both Republicans and Democrats say Mormon beliefs are very different from their own, and roughly a third across party lines say the Mormon religion is not Christian. As Republican and Republican-leaning voters evaluate Romney, very few say his faith is a factor. A majority of Republican and Republican-leaning voters (56%) know that Romney is a Mormon. But just 8% say Romney’s religion makes them less likely to vote for him; 44% say it would not make a difference. Among white evangelical Republican voters, however, 15% say Romney’s religion would make them less likely to support him. Opinions about the Mormon religion are a factor in how GOP voters view Romney. Roughly six-in-ten (61%) Republican and Republican-leaning voters who say that Mormonism is a Christian religion have a favorable opinion of Romney. That compares with 51% of those who say that it is not a Christian religion. 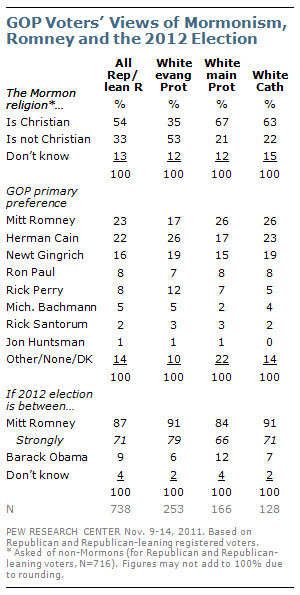 And Republican voters who say Mormonism is not Christian are far less likely to support Romney for the GOP nomination. But these same Republicans also are among the strongest critics of Obama. Nearly six-in-ten Republican voters (58%) who do not view Mormonism as Christian have a very unfavorable opinion of Obama; that compares with 44% of those who say it is Christian. And support for Romney in a general election matchup with Obama is just as high among Republican voters who say Mormonism is not a Christian religion as among those who say it is (89% and 86%, respectively).